I'm trickling back to the internet today! It's raining today, so porch life is out, I thought I'd catch up with my Blogging friends and join in on Michael's Scribble Picnic's theme today: Classic! (follow the link to see other wonderful scribbles!). 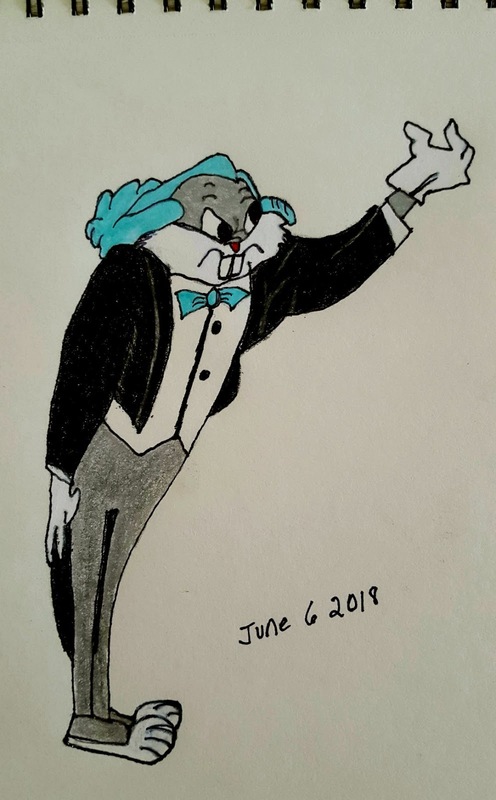 Firstly, as I always try to include a Looney drawing, I thought about how Bugs Bunny took on the role of Leopold Stokowski. Bugs conducts a "classic" while he gets revenge on the tenor who annoyed him earlier in the day. Actually, the Simpsons did a funny version of this horror! I'll just give you an update on what's been happening here at the cottage. :) The potatoes are GROWING AND GROWING!!! All of my 16 containers are producing from 4-8 plants each! Yippee! It'll be a spuddy winter that's for sure! :) All of the other produce is doing fine, except sadly my strawberries. :( Only 2 of the 12 roots I planted are doing okay. Oh well...it was an experiment! In the kitchen it's been summery fare. 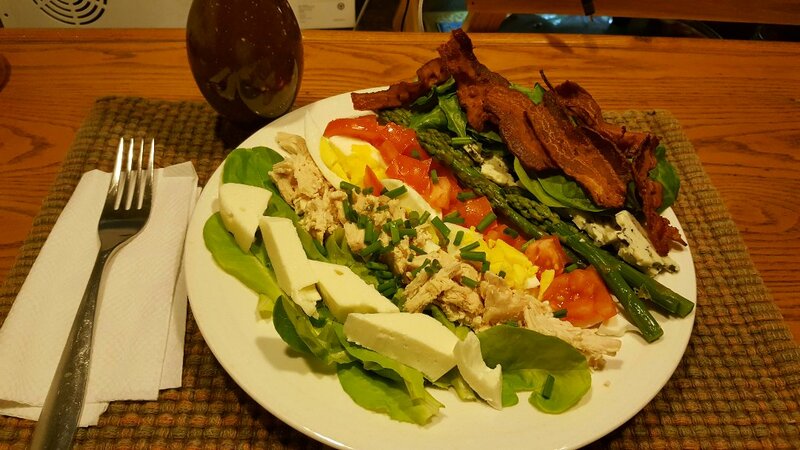 I made our first Cobb Salad of the season! Homemade Mozzarella makes it that much tastier. :) I am SO grateful for home grown produce right now! At the moment, all I can harvest is lettuce and herbs but already that brings me so much joy...I can't wait until I can pick some of my own tomatoes too! I made a Nectarine Dutch Baby one evening when the fruit was nice and ripe. Marlene, Proud Jack and Charlie - Enjoying Their Mountain Hikes! 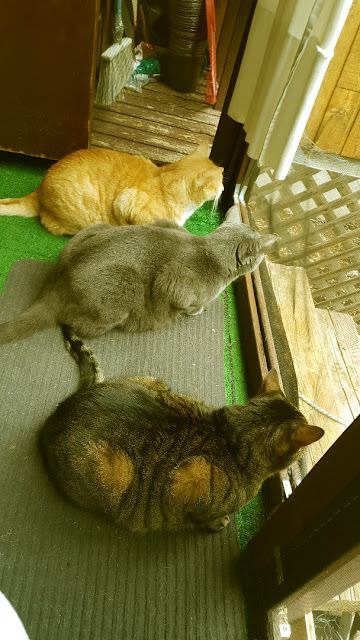 Oscar, Leo and Dana - Safe On The Porch and MESMERIZED by the Bird Feeder! After getting the container garden up and at 'em...I am now enjoying the porch life. I hope you're all having a fantastic end of spring and beginning of summer! I can almost not type my horror at what that Vet told you.... :-( Why even say that? She didn't know. How could she know?? LOL Sandi!!! :) I always love your comments. :) Exactly is all I can respond to your statement about the vet. My little Jack Rabbit is perfectly healthy. You know, there was a time when I thought I should go to vet tech school...just to diagnose my own pets. Maybe it wasn't such a bad idea. That with my gut instinct, I think I would have made a good vet. I love that Bugs Bunny cartoon and your Leopold drawing is awesome! 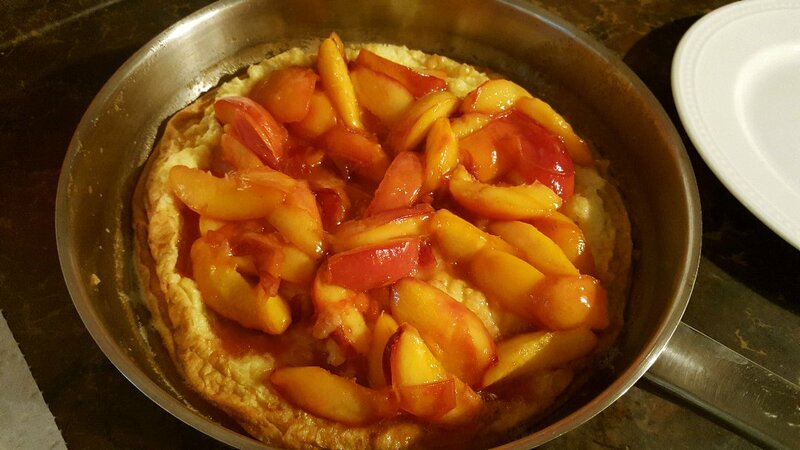 And oh my, doesn't that nectarine dutch baby look yummy! You have amazing instincts. Yay for Jack being all better. What yummy nom! Your cats made me LOL at their intense attention to the outside. 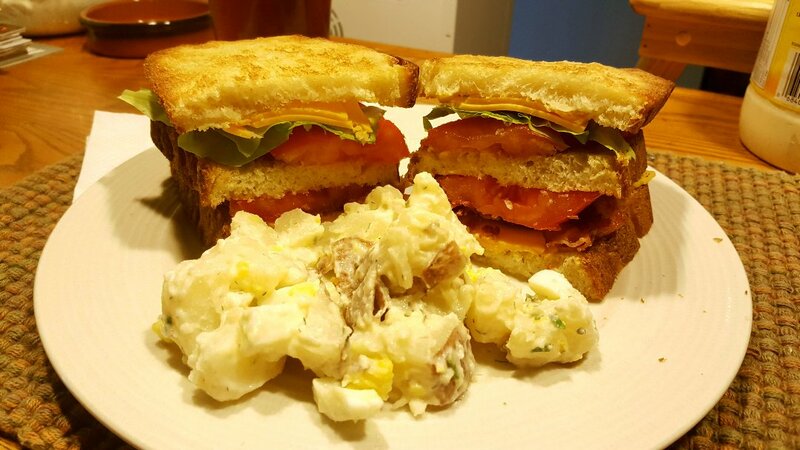 Nice work on the 'Classic' themes Rain, and your food looks so delicious! Thanks Debra :) I think that Tenor deserved Bugs' shenanigans lol! The Dutch Baby was AWESOME with lots of pure maple syrup!! Thanks Stefanie :) We panicked at the vet in March. Both Alex and I should have listened to our instincts sooner and saved ourselves $400...but they are supposed to be experts...anyway...I'm just so grateful that my Spaghetti Jack is back! :) The cats are hilarious on the porch....they LOVE being there and watching the bird feeder. Thanks Christine :) I love the themes that bring out people's creativity...your Potato Head was fabulous!! But great art rendition of it!!! Ohhhh your foooood!!!!!!! Oh mercy!!! Never heard of a Dutch Baby! 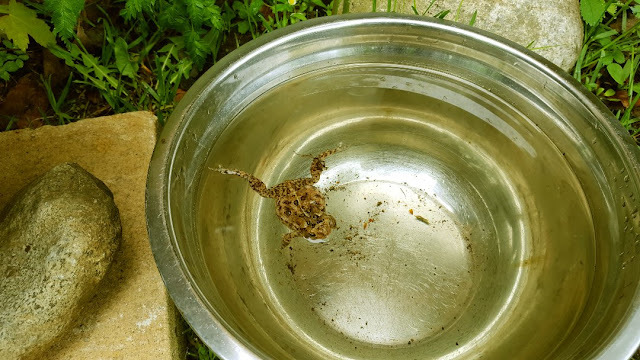 Frogs get in our pool skimmer too. They jump in the pool. Why? We have a pond, near by. And water, in the woods, across the road. Just LOOK at Jack!!!!!! So cute and perky! So glad you stopped what she was telling you to do!!! All your critters are so happy looking. 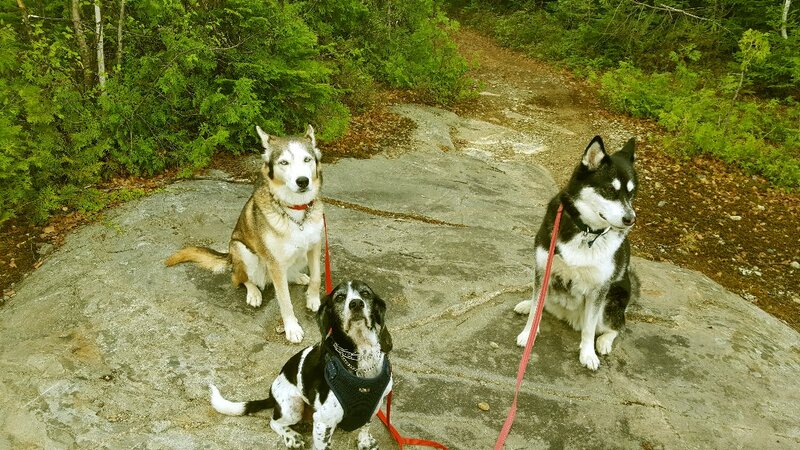 Bet they are happy to have their own family/pack back. And super for both you and them, to do these walks. One of the finest Simpsons episodes. I do like Lee, a lot, yes. Love that you have potatoes and make your own cheese. Such cute pups. We have two. We love 'em. I like your bugs bunny take, though I like it better when bugs smiles. What a fun post dear Rain - I'm breathless reading of all your happenings, love everything but especially the pic of the three kitties!!!! Love that photo of the cats. Tiger is always looking out the door and windows. Our potatoes are actually flowering now. I had to hill half of them yesterday. We are still not done planting. It's the latest I have ever put my garden in. Here's hoping for a good garden bounty for all of us this year. Good stuff going on at your place! That is so cool about the potatoes. And I hope everything else grows in leaps and bounds, too, because there's nothing like home grown. I'm so glad Jack is doing wonderfully! Good thing you listened to your gut and he's now a happy and healthy pup. And that little frog...so relieved that he is okay! hi rain! the cats are too funny! what good news about jack! i always listen to my gut. we had a couple days of cool weather and now back to the heat. your dinners look so good too! I loved the episode of Bugs Bunny and the SImpsons lol! I love the cat line-up! Slimmie is mesmerized by bird TV, too. Vets. I am very lucky to have a wonderful vet. When PB injured his spine, he gave me very good advice and a hopeful prognosis. Both came true. Which is a good thing, as PB is spring-loaded! You are right, though. You follow your gut and you know your boy best. Your garden is wonderful! No potatoes for me this year, but I will enjoy yours - virtually! It was "the Pit and the Pendulum" that creeped me out the most of Poe's stories. You'd like my place. Right now we have three indoor cats, and 9 barn cats. Hi Rain ~ My daughter and grandson from Oregon are visiting so I'm late in getting around to visit. Love the classic bugs video, and even through I'm not a "horror fan"....I do love Edgar Allen Poe. Your tale tell heart is great. He's wonderful! Love your version. Made me smile when your page popped up. Hope you're doing well. Hi Nancy :) I think you should definitely plant spuds next year! 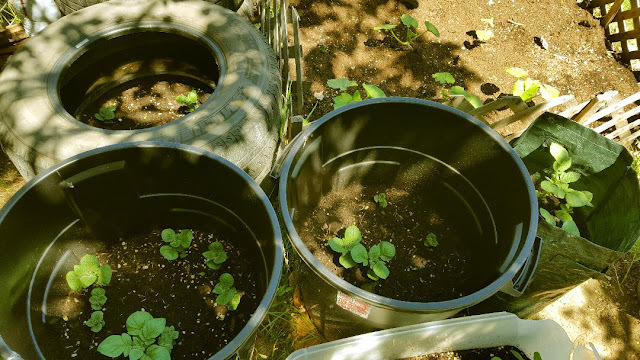 I've found they are so easy to plant, especially in containers. I'm sorry about your strawberries, they were looking so good!! Hi Rain! Soo glad you saved that poor little fellow in the dish..and to see that wasn't one of your other delish dishes! hahaha. As i noted on IG, your pieces are wonderful additions to the picnic. I can't decide which one I enjoy more. The horror one of course is deeper clearly, and so well done, but, yes, let's explore the sociopath angle maybe closer to Halloween! hahaha. Great stuff. thank you sooo much. Hope you and Alex are doing well. P.S. Be sure to check out my latest post on the new theme btw. I can totally see you having fun with this. Hi Michael :) Thank you! We are doing very well. Oh, ha ha ha...I have tried frog's legs before but shudder....never again. I saw them on the plate and couldn't bring myself to eating them, all I could think of was the poor little critter...oh and yes, we WILL explore the sociopath angle come October!!! boo ha ha ha! :) I like the new theme!!! You've picked a great classic with Edgar A. Poe. 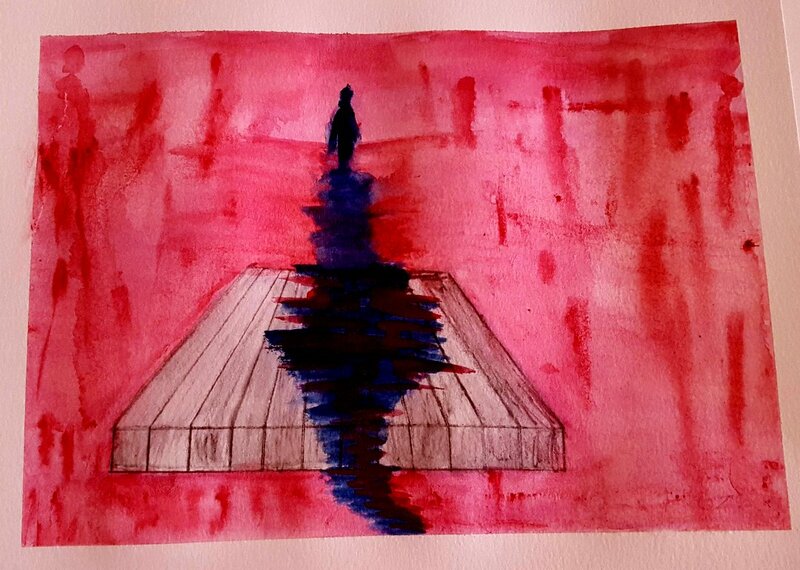 Your watercolor is stunning, even with the macabre subject matter. The colors are so vivid. I love hearing about your gardening adventures and seeing what you've been putting on the table. You always have such great posts Rain! Such amazing food you make!! Always making my mouth water! Love seeing all your fur babies! The cats all lined up, made me laugh! LOL! That little frog is so cute! Love Bugs!! And, your scary one was excellent!! Big Hugs! I love your food pictures :D I'm on a tight diet at the moment as everything is giving me heartburn, but your pictures cheer me up. Glad so many of your plants are doing good. Sorry for the ones that are not. Great exercise for you and the dogs. So very happy that Jack is doing so well. My son and his wife just had to have there 11 yr old Shepard put down and it has been hard on both of them. I have cried and hurt for them. Like Cory said, he has had do it before but this one was really hard..so glad that you did not have to go through that with Jack. Love the cats all lined up! Animals are so fun. Sorry for late replies my friends, I'm still not getting comment notifications!! Love your pets! Christoper Lee made an amazing Saruman in the LOTR movies. Glad you saved the little frog. Amphibians are having a difficult time everywhere. You create such delicious looking food!